Develop an application that allows you to view e-catalogues on mobile platforms (Android, iOS) and Desktop platforms (Windows, OS X). App features: viewing/saving directory, sending on e-mail, printing and adding to favorites. Schneider Electric has more than 50,000 kinds of products. Information products are needed to many people - installers that are on the object, to sales consultant, designer at Bureau sitting in front of a large monitor. 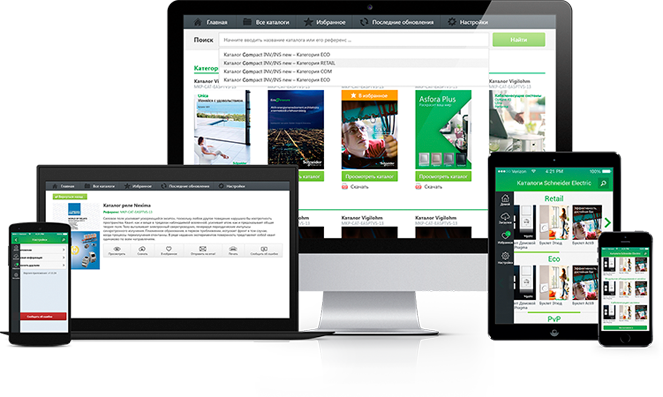 To facilitate access, we have developed a application with updated database of current catalogs Schneider Electric for all types of modern platforms like computers and smartphones/tablets. Each of the platforms has its own architect, as the application itself and the algorithm of query processing. This greatly complicates the development process, as each operating system has its own programming language and specificity. To avoid conflicts, data exchange applications and Databases that store directories and information about our products, we decide to develop a special interface-the mediator API. Through it, client applications can access a single Database. API functionality includes development of special commands from client applications, which are processed and transmitted to the Database. This allows you to use commands on any modern platform. Developing Control panel, to make customer able to upload new or edit old catalogues. In this system you can manage all added catalogues stored on the system. Making an elaborate card to add new product catalogues. View as commented in all the fields, even a new user can easily understand how to add a directory. The search takes into account all of the possible writing options search products given the peculiarities of the Russian language. For example, if a user searches for the catalog product "Easy nine", then it is enough to write "izi 9" . Single directory can contain useful information for different types of users. When, for example, installe will look for information on the cable channels and switches, the system will offer associated support directories. To alert mobile users about important events or updates to directories, the mechanism for push-notifications. We have also set up automatic notifications when updating directories. Users are inundated with messages. Refuse to automatic notifications. Make a separate interface, where the push notifications are created manually. All users who have installed application is recorded in the system. This allows you to keep track of who updates the application, what operating system, and also helps to fix the incompatibility of the app with devices. The target audience of this application are professionals in the industry electrostreak (siloviki, designers and suppliers). Nice to get a high rating with the first version of the application. To promote the application we developed promotion page. Retain specialists from the Marketing Department who are engaged in increase of conversion in our company. The system determines what type of device the user is viewing the page and inserts a special link just for its platform. No templates! Only thoughtful and a letter for mailing. Adaptive layout for mobile devices. Promo letter will be sent by the partner network Schneider Electric. Target is - not visiting the site BUT the app installing! To avoid the SPAM, use a specialized service Unisender. According to the results of the calculated conversion rate of each stage and build a "sales funnel"